Brrrr! Winter is in full swing here in the Northeast. I know I am doing everything I can to stay warm. If you are experiencing a little chill too, I hope me and my friends, from The Reading Crew, can bring you a little warmth and inspiration through our Winter Mentor Text link up. blog. So grab yourself a nice warm beverage, and settle in while you learn about resources you can bring back to your classroom in the new year. This fall my family moved "back home." With moving, came a new house, new daycare for my son and a new job for my husband. For me, after being a reading specialist for the last four years, I'm not sure if I could handle one more big life change. So, I consider myself very lucky to have kept the same position in my new district and school. I am now a proud POLAR BEAR (my new elementary school's mascot)! Well, when asked to pick a book for this link up, I knew just the one! 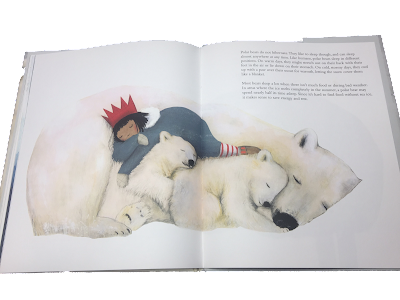 The Polar Bear, written and illustrated by Jenni Desmond. The Polar Bear is an informational picture book about the polar bear's habitat, body, diet, and life. The story is told through the eyes of a young girl who is reading a book about polar bears, and her character is placed in many of the illustrations. The factual text is paired with fantasy like illustrations that won this book the New York Times Best Illustrated Children's Book of 2016. Desmond does a wonderful job of presenting factually accurate information about polar bears in an easy to understand way. For example, Did you know the bumps on a polar bear's paw are similar to the bumps on a basketball? Desmond seems to be creating a "series" of nonfiction picture books, by writing about "vulnerable and threatened species." Her first book (for Enchanted Lion publishing) addressed blue whales, and her next book is set to uncover the life elephants. As I said before, I am now a proud Polar Bear! When I introduced this text to my students, I prefaced them with my wish to get to know our school mascot. I don't think it is enough to just know what our mascot is, we need to know why we are Polar Bears, what characteristics do we have in common, and what can we learn about the animal to make us stronger Polar Bears. Well that did it for my kiddos, they were all in. Unless your school mascot is also the Polar Bear, you will need to think of a bigger "buy in." But, I must say that polar bears are really interesting creatures that deserve to be more understood. With the winter season upon us, there is no better time to study and explore the Arctic. You could use this book, and the resources available as a collaborative research project, that sets the stage for the students to begin their own Artic animal research projects. 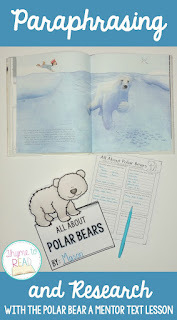 Before reading, you will want to provide the students with the note catcher (provided in this resource), so they can be actively listening and recording facts about polar bears. If working in small groups you may only want to tackle a few key topics at a time. Or, if you using this text with the whole class, you may wish to break the class up into groups so they only have to focus on a few topics, and later have the groups share out their responses. While reading this text aloud, stop to discuss vocabulary (evolved, repellent, solitary, etc.) and use the illustrations to construct more meaning for your students. Use some of this time to show your students how they can listen for key words in the text, and how those words can help them to predict when an answer might be coming. Also, use this time to show your students how you want them to use the provided notes catcher. When using graphic organizers, I always take into account the ability of my students. My first graders are still working on writing a complete sentence, so to tell them they don't have to on a graphic organizer is very confusing, and sends mixed messages. My firsties always write in complete sentences. Although my second graders (and up), have a better grasp of being able to go back and forth based on the task. I allow them to just write key words and phrases. This also allows me to then help them answer questions in their own words and paraphrase the text. In the full resource, is a graphic organizer with suggested topics (and it is fully editable) to help guide your students while listening to the text. An alternative to reading the whole text aloud to upper grade level students, would be to split the class up into groups and copy pages from the text. The students could read the section provided to them and pull out the relevant information needed to answer the questions. 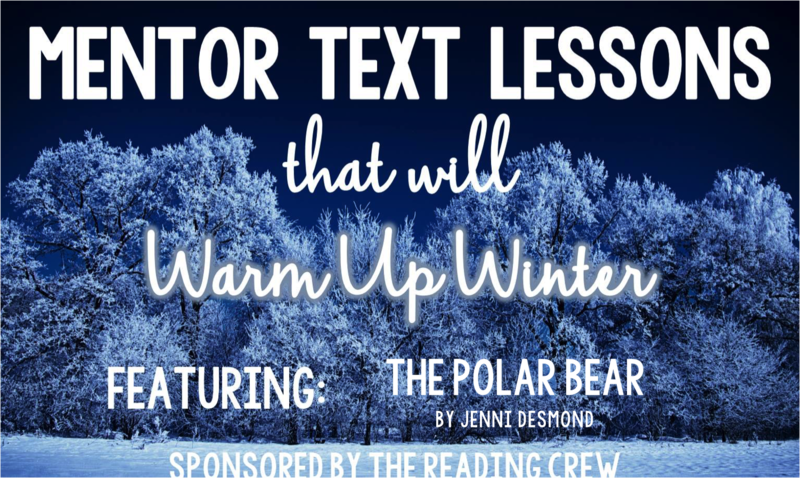 You could also provide them with supplemental texts on polar bears so their information comes from various sources. After your students have pulled key details from the text to address all of the topics, you will need to instruct them how to paraphrase. Paraphrasing can help your students bring in prior knowledge, show their deep understanding of content and also better remember what they have read. 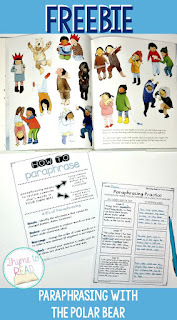 The sooner your kiddos can begin practicing paraphrasing, the better. My younger students (grades 1-3), always paraphrase, however for my older students (grades 4-5), I teach them cite, then paraphrase. To teach paraphrasing, I have my students re-read the section they are trying to summarize, re-read their notes, close the book, turn over their paper and answer my question using the 4 R's of Paraphrasing. In this forever FREEBIE, is an anchor chart and quotes from the text for your students to practice paraphrasing (editable options of both are included). Teaching students to paraphrase takes a lot of modeling (with think alouds), practice and time. When my students have had the most success, it is because they have been able to discuss their ideas with a partner, before committing them to paper. After your students have successfully answered the key questions, they can publish their polar bear research project. Included in the full resources is a student publishing book. The pages included address the same topics from the note catcher (and there is an editable page too!) My students of course enjoyed answering my final question of 'Why are you proud to be a Polar Bear?' They used the information they learned from the text, and we developed a list of qualities of a polar bear. They thought about how they have or could embody these qualities to be the very best Polar Bear they could be. As an extra bonus, I have included this question on a page of the published book. Even if your school isn't the "Polar Bears," your classroom could adopt this amazing animal as a classroom mascot. Or, your class can use the included animal research template to provide information about various animals that could become your class mascot. Tie in some persuasive writing, a lesson on democracy, and you have yourself a class mascot election! To Summarize: Paraphrasing is an important skill for your students to practice. By using the 4 R's of paraphrasing (Remain, Replace, Rearrange and Recheck), and explicit modeling/guided practice, your students will gain ownership of new content. 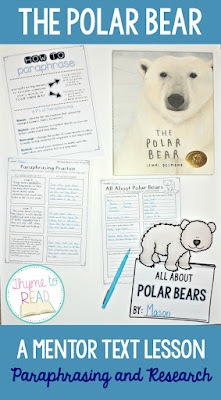 The Polar Bear by Jenni Desmond, is a wonderful text to practice paraphrasing and then follow up with some simple animal research. 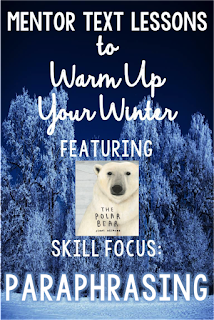 Your students will not be able to resist sharing all they learned in this adorable All About Polar Bears book. PIN THIS RESOURCE FOR LATER! Thank you, Megan. I just purchased that book. Love it! It is a beautiful book. Not exactly what I was expecting when I picked it up at the book store, but I was very pleasantly surprised. I hope your students enjoy it. I have never seen this book. Thanks for introducing it to me! It is my pleasure. My new love for Polar Bears has introduced me to several new texts, and this one was a quick favorite. I love seeing some many new and new to me titles with these link ups. We are so lucky! Paraphrasing is such a difficult skill - what an excellent resource. I also love the text!